I’m not much of a baker, but this dessert is so easy that I hardly call it baking. 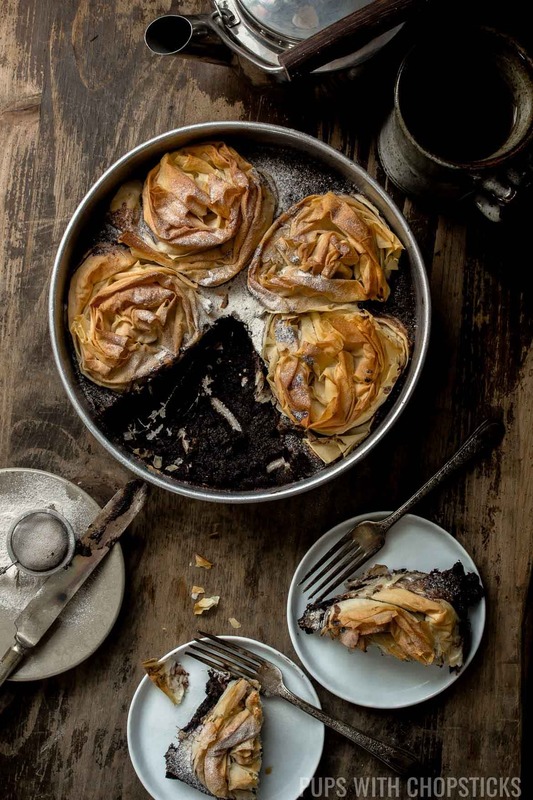 🙂 The steps are simple, make crispy phyllo bundles with store-bought phyllo sheets and fill it with a sweet black sesame chocolate filling and continue to bake until it is done. Pretty simple right? Ruffled milk pie is one of those desserts that you can bring to a party or a gathering because it’s super easy to make and looks absolutely beautiful. 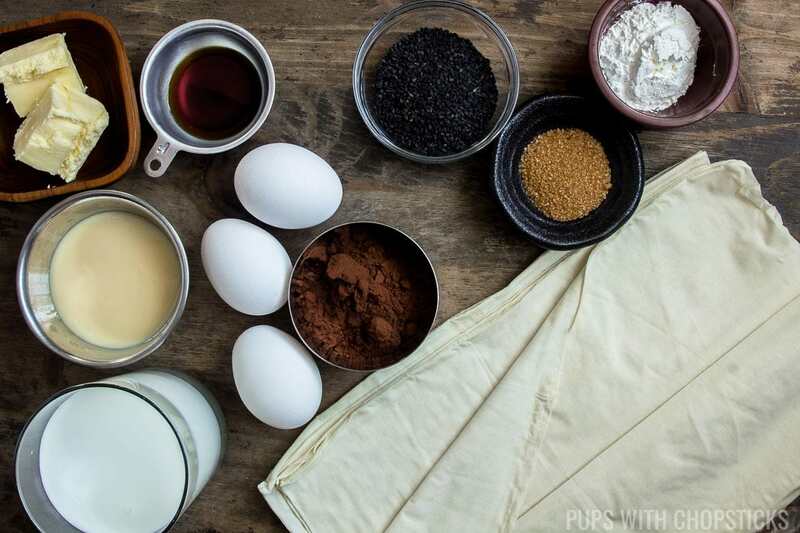 For this black sesame chocolate ruffled milk pie recipe, you can find all ingredients at a local grocery store. If you cannot find black sesame seeds at your local grocery store, you can find it at an Asian grocery store or you can substitute it with white sesame seeds. 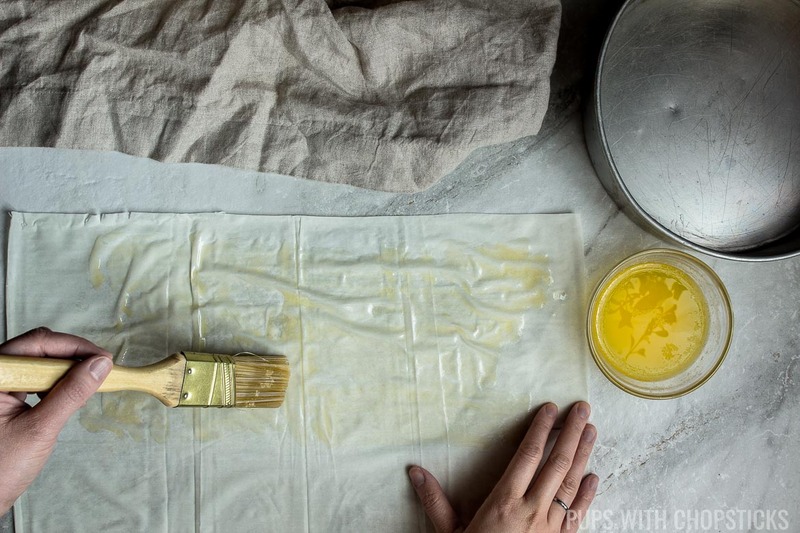 Since phyllo pastry sheets are paper-thin, it is very easy for it to dry out when we are working with it. Brittle phyllo pastry breaks a lot more easily so it is hard to shape it or brush butter on it without it tearing into tiny small pieces. 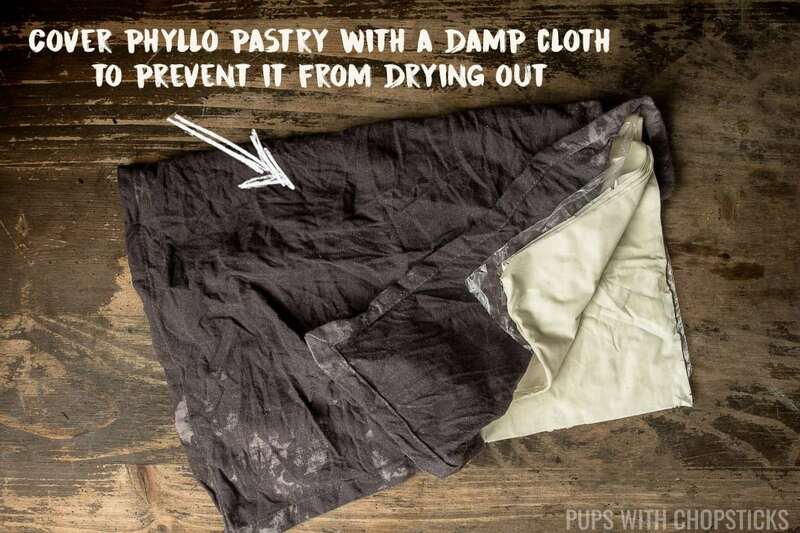 To prevent this, take a damp towel or paper towel and cover the sheets that are not currently being worked on and work on one phyllo sheet at a time. 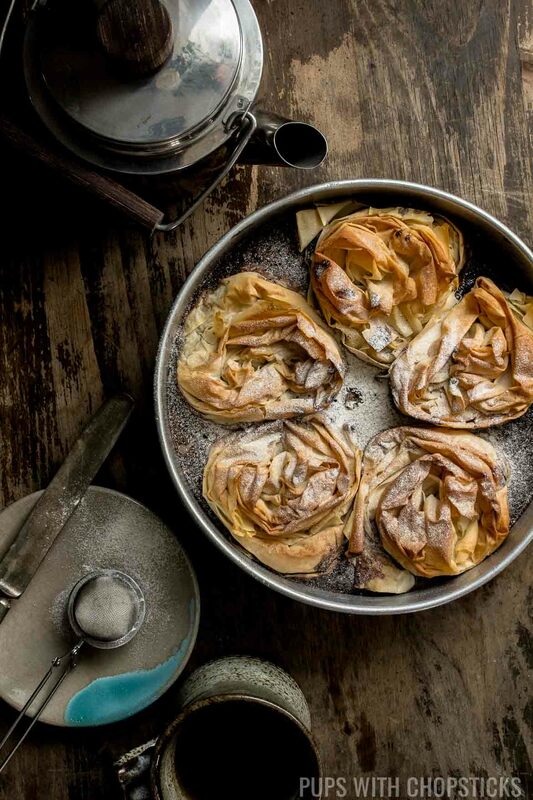 Make sure the towel is damp and not wet – if the towels are wet, the phyllo pastry will absorb the water and turn mushy which will make it hard to work with as well because it will meld the sheets together. 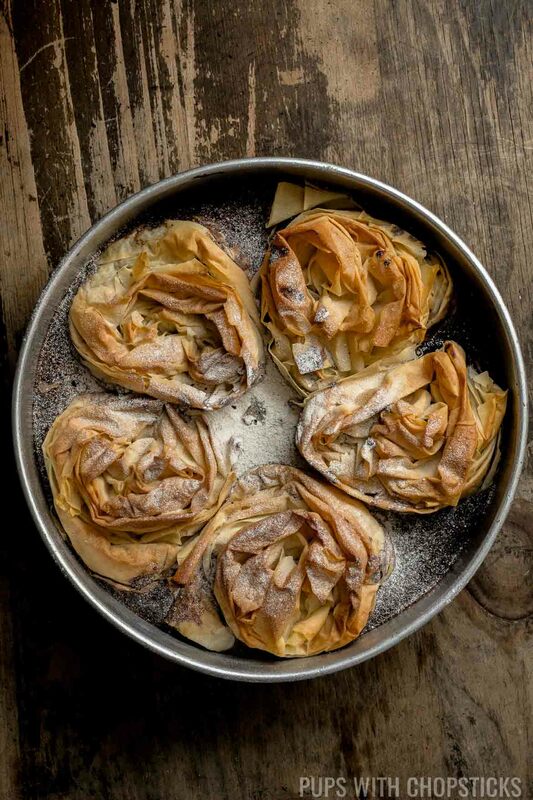 Making phyllo bundles are super easy, and it’s okay if they are not perfect, they will still look fantastic. 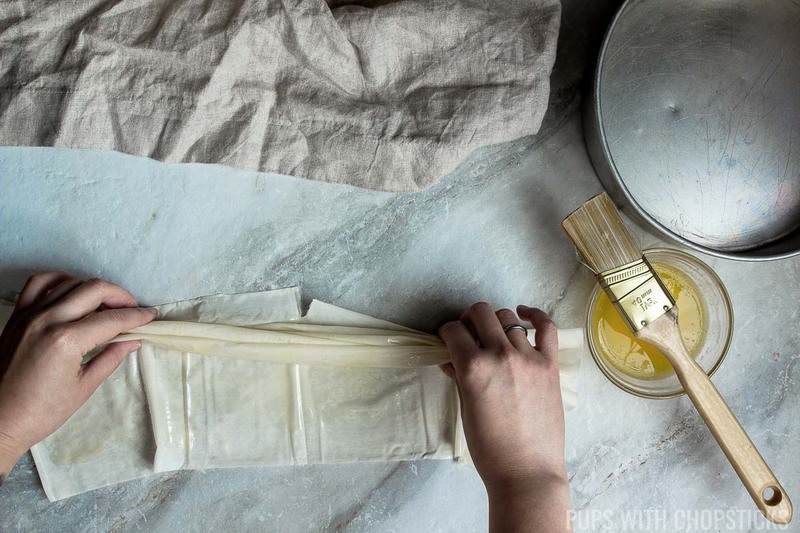 To start off, lay 1 sheet of phyllo pastry on the counter and brush it liberally with melted butter. Then lay another sheet on top and brush that sheet with melted butter as well. I like to use 2 sheets per bundle to give each bundle a bit more substance. You can use less (1) or more (3) if you like. 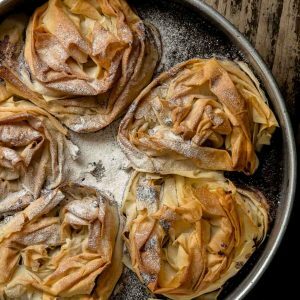 Once all the phyllo sheets have been buttered, gently grab the sheets on each end and ruffle it – it doesn’t have to be perfect but try not to pinch it too hard. The looser the ruffles, the crispier it will be. Once the sheets have been loosely ruffled, coil it in a spiral gently – try not to coil it too tight for maximum crispiness! To make the bundles crispier, I like to gently tuck the end underneath the bottom of the bundle to give it a bit of height so that when I pour the chocolate filling in the pan, I have a lot more phyllo sitting higher up for more crispiness. I also like to gently pinch the middle up higher as well once the coil is complete since I noticed that the middle tends to sag down. Whenever you work with eggs in a custardy dessert, you usually want to temper it. Tempering means you boil a liquid first (usually the milk) and gently pour it into the beaten egg slowly while mixing vigorously. When you put an egg directly into something very hot, especially over a stove it will get clumpy and become scrambled eggs. For this recipe, I didn’t want to dirty that many dishes so I stream-lined it so you don’t need to worry about tempering the eggs. There are not many eggs in this recipe anyway, so you can easily mix everything together and pour it directly into the pan and cook it in the oven – perfect! 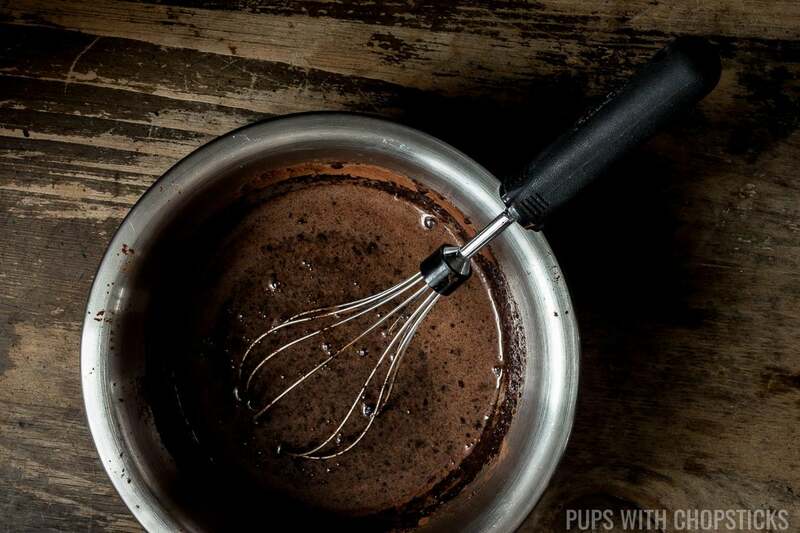 The only extra step you need to do, is to separately mix the glutinous rice flour with the water before you add it into the chocolate mixture. Glutinous rice flour can get clumpy so I mix it separately with a bit up milk until it is smooth and has dissolved fully into the milk before adding it into the mixture. 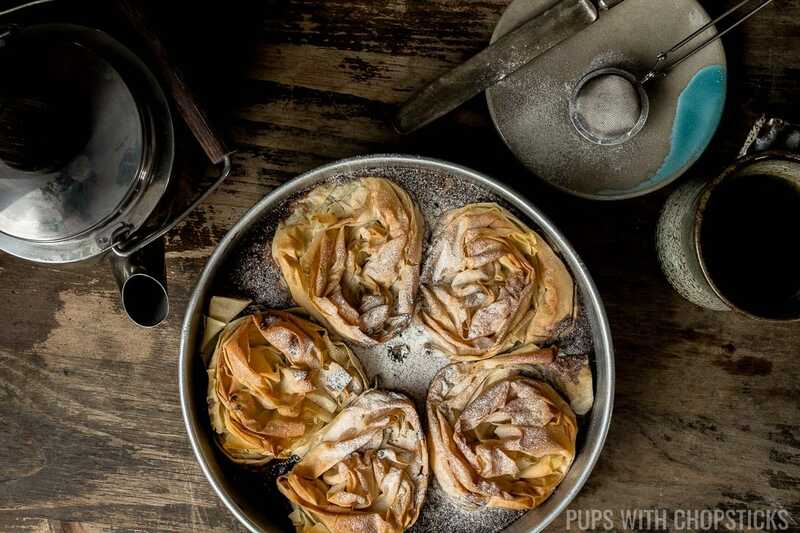 Whenever I made ruffled milk pie, I always poured the filling over the phyllo pastry because traditionally, that’s what you’re supposed to do but I was never happy with the result because it never gave me crispy phyllo pastry and the final product was always missing that crispiness. I started to experiment with leaving a gap somewhere in the pan and pouring the filling in the gaps and gently lifting the bundles so that the filling goes under each bundle before setting the bundles back down on the filling. By not pouring the filling on top of the phyllo, it left the tops drier for a crispier texture. Cut the butter into 1-inch chunks and melt it over the stovetop or in a microwave. (If you use a microwave, make sure you heat it at 10 seconds intervals and check on it before adding another 10 seconds else it will splatter everywhere and it’ll get messy 🙂 ). Set the melted butter aside. Use a 9-inch pan and butter it or line it with parchment paper. 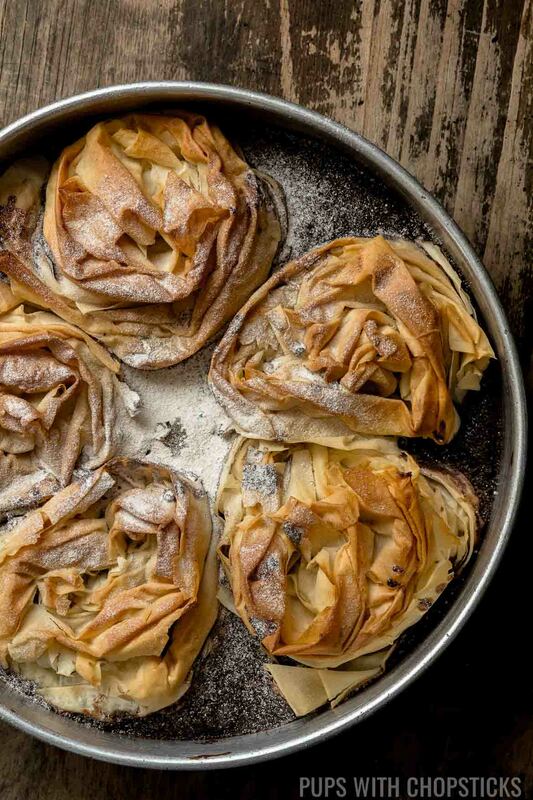 It’s important that you use a pan that is 9-inches or larger with a height of at least 2 inches so that the chocolate filling doesn’t overflow or get too high – which will reduce the amount of crispy phyllo exposed by half. Get a large kitchen towel or some paper towel and wet it. Wring it out really well so that it is just damp. 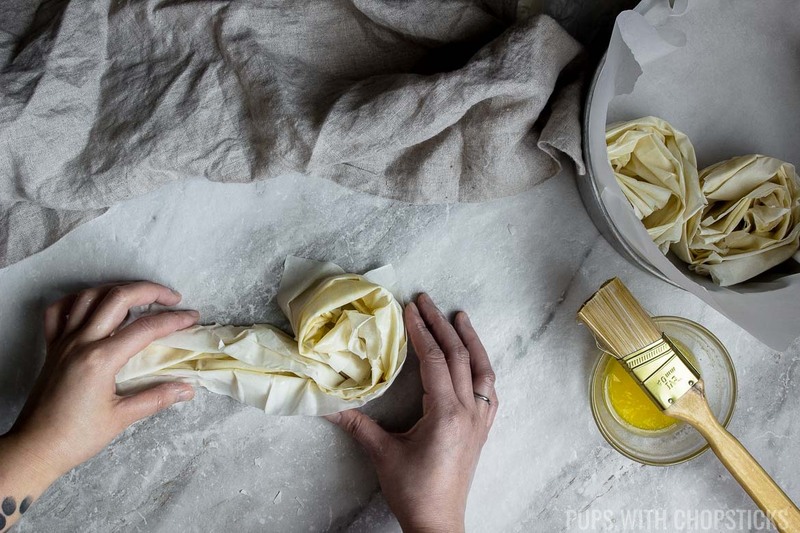 Remove the phyllo pastry from the packaging and place it closeby on the counter, folded in half and cover it with the damp towel. Take 1 sheet of phyllo pastry and brush it liberally with melted butter. Take another sheet of phyllo pastry and lay it on top of the buttered one and brush melted butter on it liberally as well. 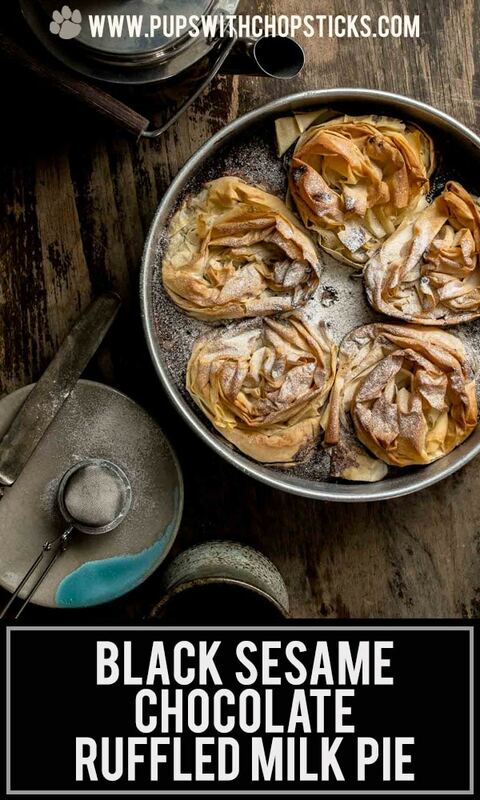 Gently pinch the pastry into ruffled folds on the 2 ends and the middle. Gently spiral it into a coil and tuck the end underneath the bottom so that the bundles sit higher (this is to expose more of the phyllo pastry during baking for more crispiness!) I like to also gently pull up the middle of the coil as well to make it sit slightly higher. Set the bundle in the pan. Continue steps 4-7 until you have 5 bundles in the pan. 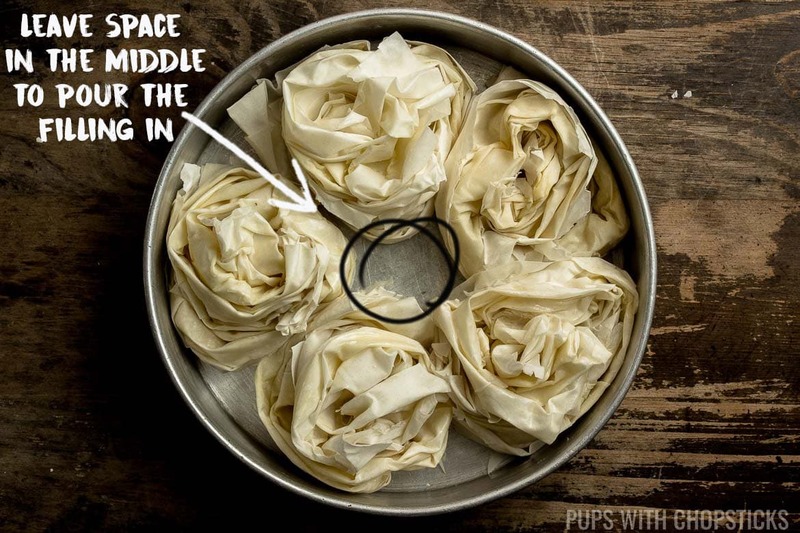 Make sure to leave a small space where you can cleanly pour the chocolate filling in without getting it on top of the ruffled bundles. 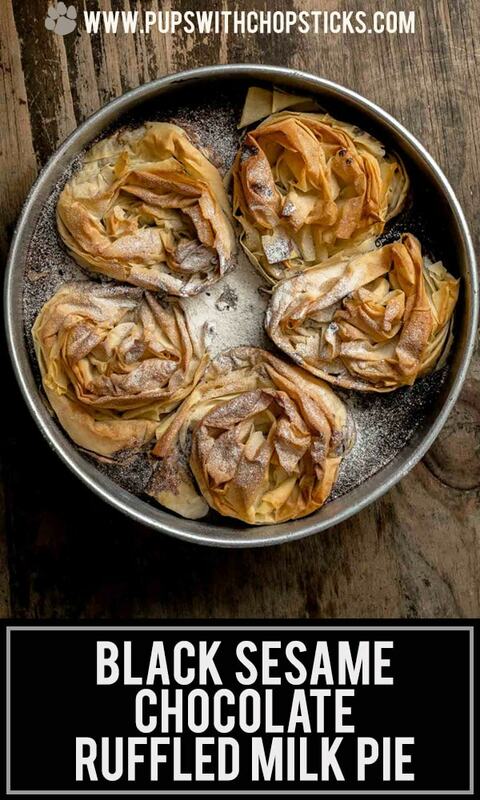 Use the remainder of the butter and brush the tops of each phyllo bundle until there is a light layer of butter on it. You may need to heat up some more butter if there is not enough. Pre-heat the oven to 350F (180C). Put it in the oven and bake it for 25-30 minutes until it is slightly golden and crispy at the tops. In a food processor, blitz the sesame seeds until it is fine like sand. In a large bowl combine everything under the ‘Black Sesame Chocolate Filling’ ingredient section and mix well. In a separate small bowl, combine the glutinous rice flour and milk and mix until it has dissolved into the milk and it is smooth. Add the glutinous rice flour slurry you just made to the Chocolate Filling and mix everything well. Gently pour 1/2 the chocolate filling into the pan with the phyllo bundles in the area where you left a little space. (In my example, I left it in the middle.) Being careful not to get any on top of the phyllo pastry bundles. Bake for an additional 25-30 minutes until the phyllo is golden brown and the chocolate filling doesn’t jiggle when you gently wiggle it. Lightly drizzle with some condensed milk or dust with powdered sugar on top and serve fresh while it is crispy. If you are using frozen phyllo pastry, you may need to defrost it in the fridge overnight or defrost it in room temperature for about 3-4 hours. 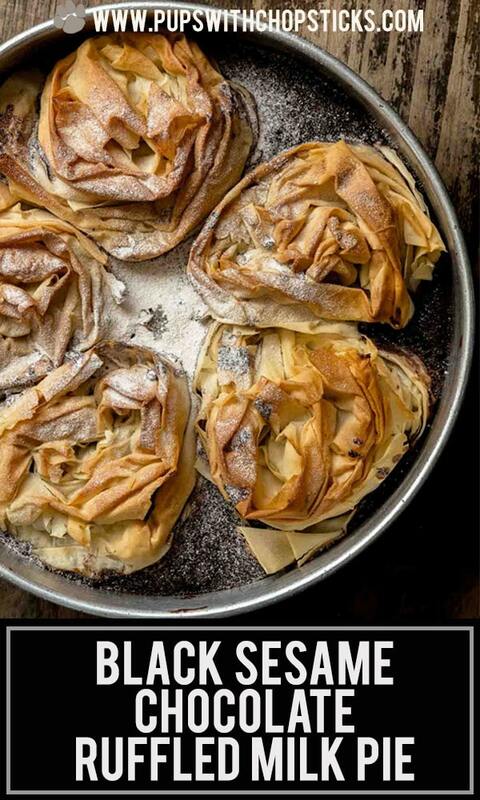 Keep the phyllo pastry in its original packaging while it’s defrosting so it doesn’t dry out. This dessert is lightly sweetened. If you prefer a sweeter dessert, add an additional 2-3 tablespoons of sugar. Leftovers can be stored in a well-sealed container in the fridge. Make sure it has fully cooled before putting it into the container. 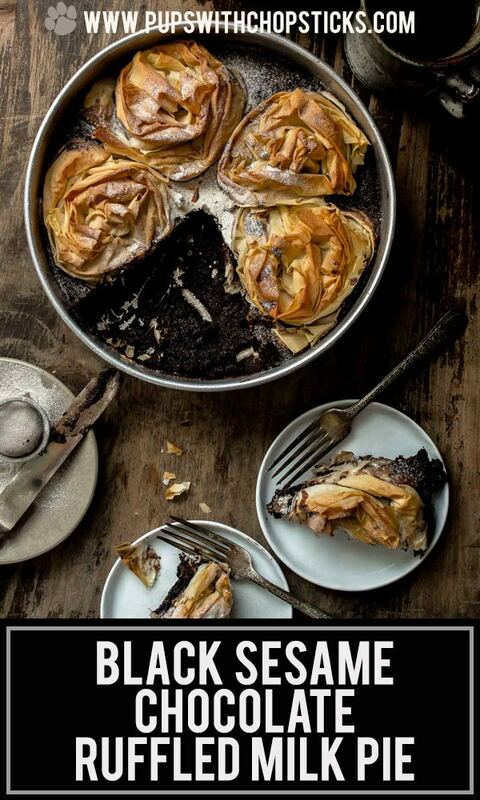 After seeing this black sesame-chocolate pie you’re officially my favorite person! I just can’t wait to try this recipe! How hot is the oven?